The 22nd Robo-One competition is going on this weekend (Feb. 23-24) at the National Museum of Emerging Science and Innovation in Tokyo. Lem Fugitt at Robots-Dreams has posted a great video from one of the preliminary qualifiers, in which each robot has to run a several-meter course as quickly as possible. The winner this year, by a substantial margin, is a new robot called Frosty. 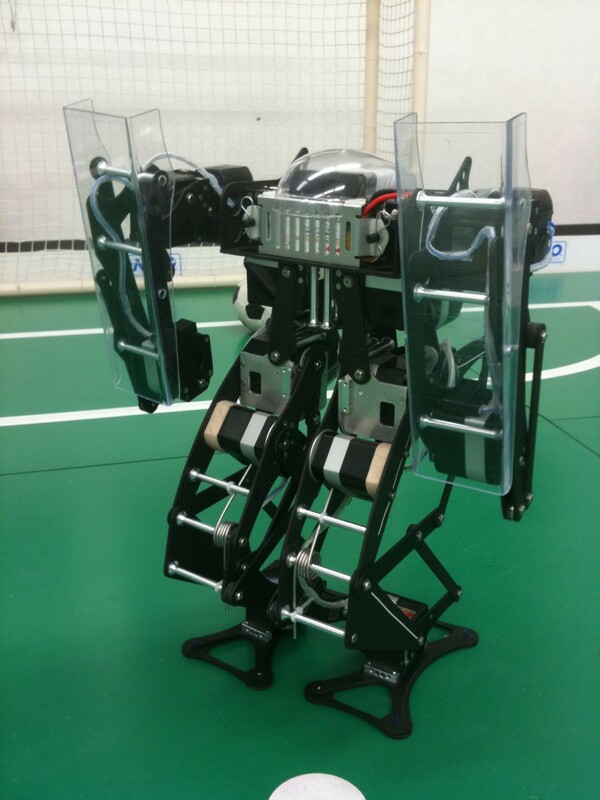 In the video below, Lem explains about this impressive robot. Frosty is 430 mm tall, and weighs 2.75 kg. Its legs are 304 mm long, and each one has six degrees of freedom (DOF). The arms have 3 DOF each, for a total of 18 DOF in the robot, all actuated with Kondo KRS-4033 or 4034 servos. It runs at about 5.4 kph, or 3.4 mph in archaic units, using two gyros for dynamic balance. Its brain is based on a SH2 processor and a FPGA. I look forward to seeing how Frosty’s speed and balance serve it in the robot combat competition! Update: from the results chart (http://www.robo-one.com/roboone1/index22.html), it looks like Frosty lost to ガルー (Garoo) in its first battle (match 17).